This Site presents information and documents (even a CD-ROM) about the famous Lindbergh Kidnapping of March 1, 1932 and the subsequent Trial of Jan 2 - Feb 13, 1935. The issues raised then are still hotly debated today because of the timeless nature of the crime and the all-too-human participants. The ingredients include: kidnapping, murder, aviation, fame, money, prejudice, infidelity, politics, capital punishment, judicial ethics, forensic science, pre-trial publicity, spiritualism, eugenics, etc. You get the idea - a Rorschach test for every generation! 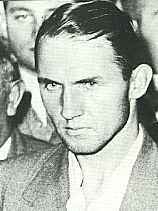 Since Bruno Richard Hauptmann never confessed before he was executed on April 3, 1936 (despite possible commutation), many theories have been suggested to identify the actual kidnapper/killer - Anne Morrow (who died in 2001 at 94), Lindbergh himself, Isidor Fisch, Elisabeth Morrow, Jacob Nosovitsky, Paul Wendel, Gaston Means, Al Capone, the Russian OGPU, the German Luft Hansa, and in a recent development, even the family dog Skean . Most people today are familiar with the kidnapping of 20-month-old Charles A. Lindbergh jr from the 1996 HBO-cable film starring Steven Rea and Isabella Rossellini. This 2-hour movie, directed by Mark Rydell, was very sympathetic to Bruno Richard Hauptmann, employing (count them) 7 child actors to play his own son Manfred, but not one for the Lindbergh child, who was conspicuous by his absence. Neither this film, nor the 1976 NBC-TV Special with Anthony Hopkins, can be considered an historical treatment of the case. 1. Wasn't Hauptmann the victim of anti-German sentiment in 1934-36 and didn't this play a role in his conviction? And what about Charles Lindbergh sitting every day at the Prosecution table during the Trial? Ans: A large number of State's counsel, Law Enforcement personnel, and jurors were of German extraction themselves. The case became an embarrassment for Germany, and three books that appeared there accept Hauptmann's guilt. They were: Rolf Nurnberg, Lindbergh, Hauptmann und Amerika, Leipzig & Vienna, 1936; Heinz Liepman, Verbrechen im Zwielicht, Berlin, 1959; Kidnapping: Der Fall Lindbergh, ed. Maximilian Jacta, Munich, 1964. Brief defensive comments were made by the Nazi Party in the Berlin Beobachter (Observer) and some criticism of legal procedure from Hans Schneickert, but the worst were published in Der Stürmer by propagandist Julius Streicher, enlarging upon the notorious American Bulletin. When Hauptmann was asked by Dr Frederick Kirsch, a visitor from Germany, about the conduct of his trial, he replied in The NY Times, Feb 6, 1935: I have no complaint, and expressed satisfaction with his lawyers. Some books (e.g. 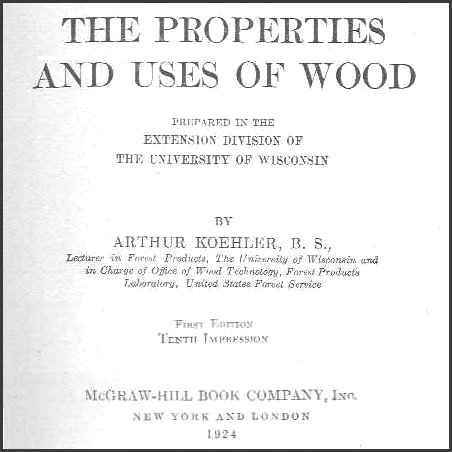 Ahlgren & Monier) and websites claim that Lindbergh improperly influenced the jurors by sitting at the Prosecution table every day, but these sources simply repeat erroneous comments by Gov. Hoffman and Lloyd Fisher - after jury selection was completed, he usually sat in a row of added seats - generally next to Col. Schwarzkopf in front of the Bar - Anna Hauptmann attended regularly and sometimes sat near her husband. 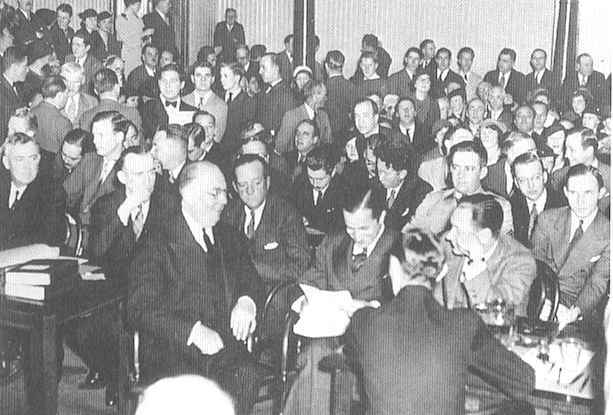 Most of the known Courtroom photos date from the morning of Jan 7, 1935 (before the testimony), and show Reilly at the Prosecution table and Wilentz hobnobbing with the Defense. Lindbergh was not in Court the day of the verdict (Feb 13). 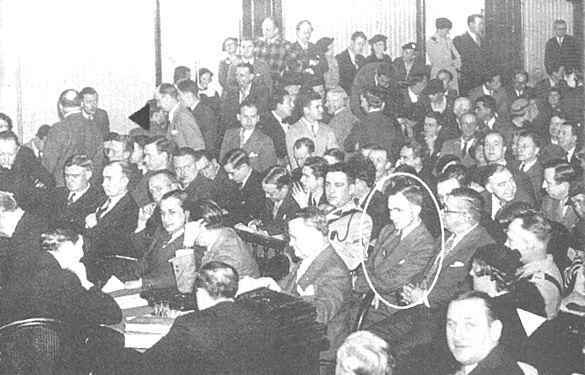 The famous photo in Waller's Kidnap showing Lindbergh "at the  Trial" table actually dates from the 1932 Curtis Hoax Trial (June 30). 2. Why was Hauptmann's background in Kamenz, Germany (where he was born in 1899) used against him in court? Didn't his wife Anna say that he only stole a loaf of bread? Ans: That's what Anna said, but Bruno Hauptmann was found guilty in two separate trials, on June 3 and 17, and was sent to Bautzen Prison in Saxony on July 9, 1919 for 5 years and one week with loss of Civil Rights - his (known) crimes there included armed robbery, burglary, larceny, and possession (and sale) of stolen property. One involved the use of a ladder to steal valuables from the second-story home of Burgermeister (Mayor) Schierach of Bernbruch (Cases 1A95-19 & A-1309-25). Eventually paroled by Judge Berndt on March 30, 1923 (with his mother's help), he nonetheless returned to criminal activity, and was arrested again on June 12th. Anti-social behavior in Germany was no guarantee of Hauptmann's future conduct as he was barely 20 years old, but when he testified in his own defense at the Lindbergh Trial, his previous record could be used against him. 3. But weren't times tough in Germany in 1919-1923? Why should this be held against him? Ans: The German population went through some wrenching economic changes after WWI, but Bruno's inability to hold a job (despite training as a carpenter before the war) was due to his own attitude about working regularly. His (abusive?) father, Hermann, died when he was 17, and he lost two older brothers during the hostilities, in which he served as a machine-gunner. Pauline Hauptmann owned their own house, and she didn't starve. As BRH's finances later improved in the US, he would send her $50 a year (until his 1934 arrest). 4. So how did BRH get to the U.S. anyway? Ans: After he escaped from the police station exercise yard on June 20, 1923, he decided to leave Germany since his new crimes meant that he had broken his three-year parole and would have to return to prison. He finally succeeded in November of that year (as a stowaway), after two previous attempts (his first provoked an Ellis Island Deportation Hearing on July 14 under his alias of Karl Pellmeier). He was never consistent about these three voyages, later listing five ships: the Yorck, Derflinger, George Washington, Portia, and Hannover. 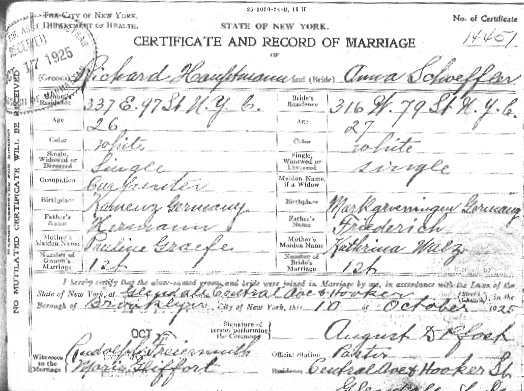 Landing in Hoboken, NJ and taking the ferry to NYC, he never applied for US citizenship, but with an introduction from Lena Aldinger, met and married Anna Schoeffler while she was working at the Rosenbaum household on West 79th Street. The ceremony took place in Brooklyn on Oct. 10, 1925 (she had entered legally Jan. 1, 1924, on the S.S. Mongolia, at the age of 25); ironically, she would die on her wedding day -- 69 years later, still loyally proclaiming his innocence. 5. Whatever happened to Benjamin Heier, the alibi witness who claimed that he saw an athletic Isidor Fisch at St. Raymond's Cemetery the night of April 2, 1932 (while parked with a girlfriend Judy Schwartz)? Ans: Heier testified that his date died soon afterwards (and he couldn't remember her exact address), but he was at the Cemetery with her from 9 - 11 pm; however, he was actually having an auto accident at 10 pm in Manhattan, 8 miles away. 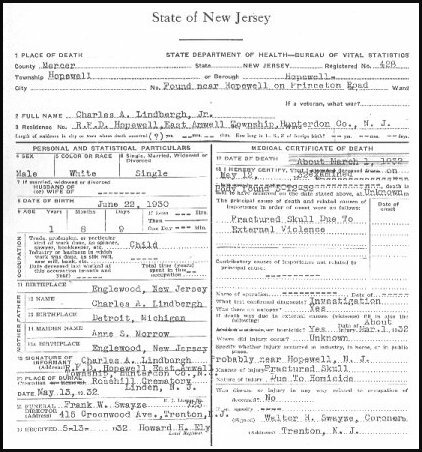 As a result, he was indicted for Perjury by the Hunterdon Grand Jury on March 22, 1935. Joseph Farber, the driver of the other car, had testified (in Rebuttal) that the crash occurred at 6th Avenue and 54th Street and that Heier was alone; actually, the young man had never paid the small damage claim. 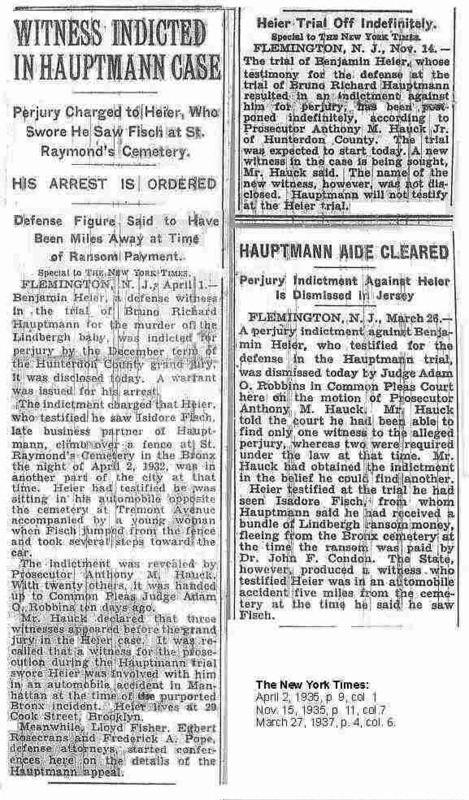 Since NJ law required a second eyewitness (and he did not appear on Nov. 14th as expected), the case was eventually dismissed on the motion of Prosecutor Anthony Hauck (March 26, 1937), after numerous delays won by his attorney Lloyd Fisher. Heier had also stated that Miss Schwartz had married someone else in July 1932, and died that August. 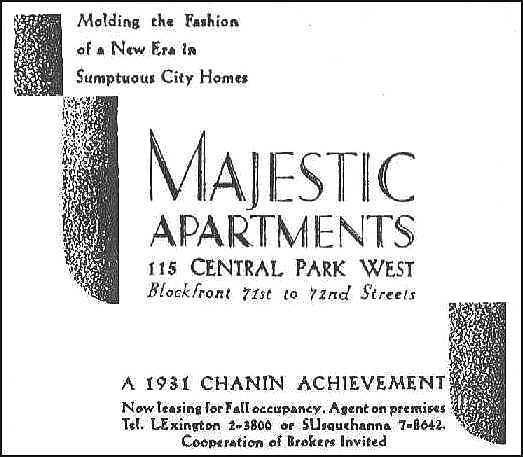 But no Judy Schwartz lived on Webster Avenue at the time, nor was married that year, or even died; she too was a figment of his imagination. 6. What is the real story behind the famous J J Faulkner gold-note exchange of $2980 in Lindbergh bills on May 1, 1933 ($10 x 296 + $20)? Wasn't there also a suspicious suicide just after BRH was arrested? 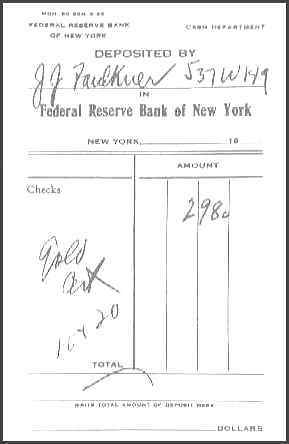 Ans: This Federal Reserve Bank transaction, received by teller James Estey (who could not recall the individual), resulted from FDR's Order #6102 (Apr 5, 1933), requiring all persons owning more than $100 in gold certificates or coins to exchange them for Federal Reserve Notes (red seal or silver blue-note). The widow Jane (nee Armstrong) Faulkner and daughter Jane Emily did live together at 537 W. 149th Street (Unit #64) from 1916-1921; Jane Emily, 37, married Carl Giessler, a florist, in February of that year and her mother died there in Jan. 1923 at the age of 69. The dumbwaiter at the Plymouth Apt. Building was (supposedly) still marked Faulkner in the 1930s and perhaps someone familiar with the basement wrote the slip. A possible suspect might be German-speaking Margaret Helen Baker (23), but she could not be located after 1933 and may have died. 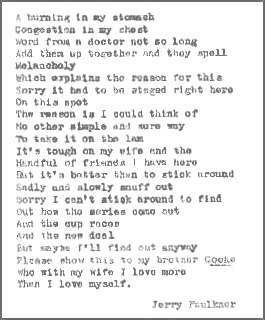 Her common-law husband Duane (b. 1899), the Plymouth superintendent (and sometime chauffeur) from 1931-32, was initially suspected because of his criminal background and disappeared for a while (he rarely paid his debts), but when located at Knox Place in the Bronx, denied any involvement - he died in NJ in 1973. However, Hauptmann himself made an unexplained cash deposit to his "Miss Anna Schoeffler" brokerage account at Steiner, Rouse just two days later - for $2575. Three coincidental links: a) the number of the Faulkner Apt was the same as Hauptmann's street address in Kamenz; b) on Feb. 1, 1934, a Lindbergh $5 Reserve note, Ser. No. B48613534A, was found at the Corn Exchange Bank in NYC and was traced to one Joseph Faulkner of Manhattan; c) The Chrysler Building (8th floor) was the location of Jerome K. Faulkner's fatal leap on Sept. 23, 1934, but his suicide note (despite some newspaper publicity) was unrelated to the case. 7. How could the kidnapper possibly know where the Nursery was at Hopewell unless it was an inside job? Ans: Butler Aloysius (Olly) Whateley stayed with his wife Elsie at Hopewell during the week while Anne and Charles lived at Englewood. 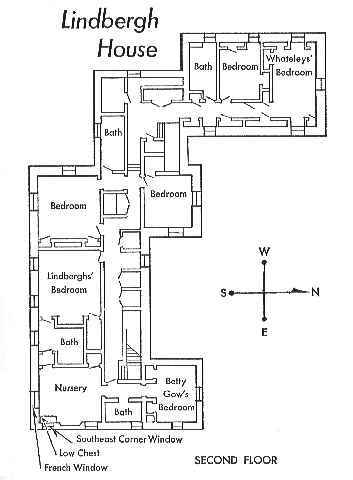 To pass the time, he sometimes gave unauthorized tours of the Lindbergh house and grounds to interested passersby. In addition, there were no shades or curtains in the new house -- the child's room was no secret. 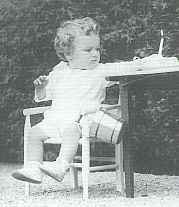 Whateley died of peritonitis (following an operation for a perforated peptic ulcer) at the age of 48 in Princeton Hospital on May 23, 1933, and Elsie in Jan. 1936. (FBI Summary Report, NY, #62-3057, NJSPM). 8. Didn't Gov. 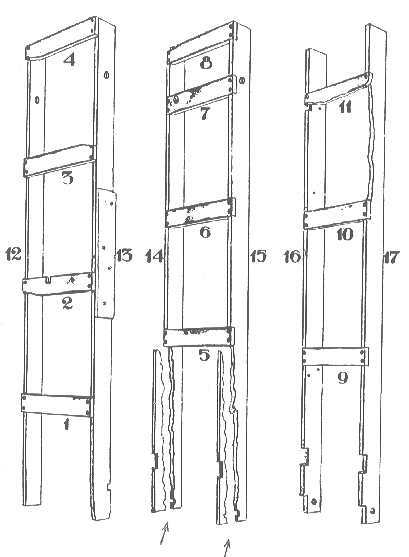 Hoffman of NJ claim to have a photo of Ladder Rail No. 16 which did not show any nail holes? Doesn't this prove that Hauptmann was framed? Ans: No such photo was introduced at the Trial (or even printed by L. Kennedy, who simply quoted Hoffman on faith), although a close-up side view by Wm. Springfield (Acme) is important beyond the nail holes because it establishes the integrity and continuity of Rail 16 from 1932-2001, and it was also published in many March 1932 newspapers; as a result, the possibility raised by Andrew Dutch and Anthony Scaduto for "backdating" the board disappears. 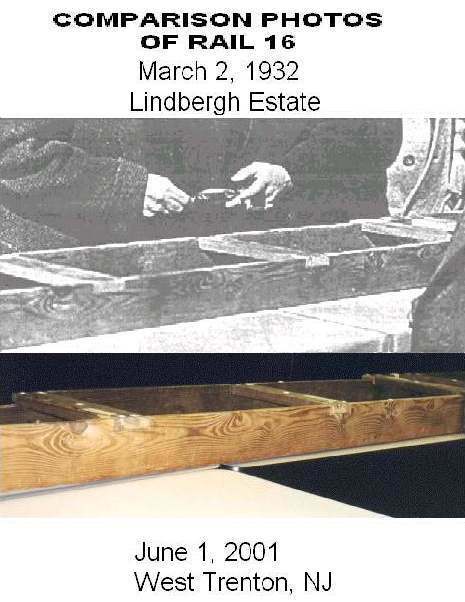 Three witnesses testified, with dated memoranda and photos (S-302 & S-303), that this ladder rail originally had 4 square-cut holes two years before Hauptmann was ever identified. They were: Arthur Koehler ("Mar-Nov 1933"), Corporal George G. Wilton (NJSP-"Mar 8, 1932"), and Harold S. Betts (US Forest Service-"June 1, 1932"). 9. Why would Hauptmann pick Mar. 1, 1932 to kidnap Lindbergh's son? Ans: The ransom notes claimed the scheme was planned for a year allredy, and the projected time-frame was probably March-Sept (see FAQ 40); it was Lindbergh's promised appearance at a well-publicized event, the NYU Centennial Dinner at the Waldorf-Astoria that may have forced the issue. 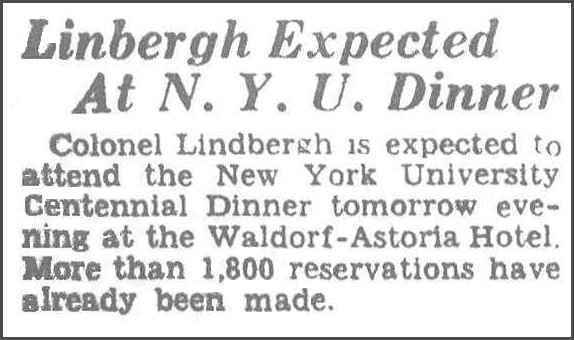 Hauptmann, a regular reader of the NY American, could have seen a brief article about this Dinner over the weekend (the NY Times of Feb. 28th omitted Lindbergh's name), but did run it as early as Feb 21st. BRH's wife worked late at the Fredericksen Bakery on Tuesdays, he did not work at the (Manhattan) Majestic Apts that day at all - and he could have designed the ladder for either the Lindbergh or Morrow homes; when fully extended with the locking 3/4" dowels, it could also reach the child's room in Englewood. He only used the lower two parts (12' 8") at the Hopewell House, perhaps arriving in the neighborhood around 6 pm. 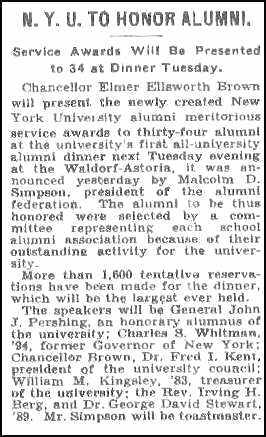 Lindbergh missed the Dinner because of (Chancellor Elmer Brown's (family crisis) error on the date) and returned earlier than expected by the kidnaper, but Hauptmann had been watching the other occupants with his Zeiss Delactis 8x40 prism binoculars and may have struck even before Lindbergh got home (8 - 8:25pm); Anne had reported a 'gravelly' noise around that time. Ladder rails 14 and 15 split at their bottom dowel holes as he came down, leaving vertical scrape marks on the wall; we do not know if the child was previously thrown or lowered by rope in a burlap bag, or whether the child's "possible" skull fractures were accidental or deliberate, or never occurred (Dr Baden's "relaxed suture" theory). He apparently injured his own left leg, later aggravating his phlebitis, and because of the sound, departed quickly, leaving all three sections, 2 dowels, and a 3/4" chisel 60-70 feet from the house -- the single, size 9+ footprint (just over 12" long) was entered into Evidence: S-36). If he had an accomplice and the dowel had not remained stuck, the ladder would probably have been removed. 10. What is the story on the ladder sketch in Hauptmann's own Notebook? Ans: At his Extradition Hearing in the Bronx, and the Trial itself in NJ, BRH said he never made a ladder during his 10-year career as a carpenter. 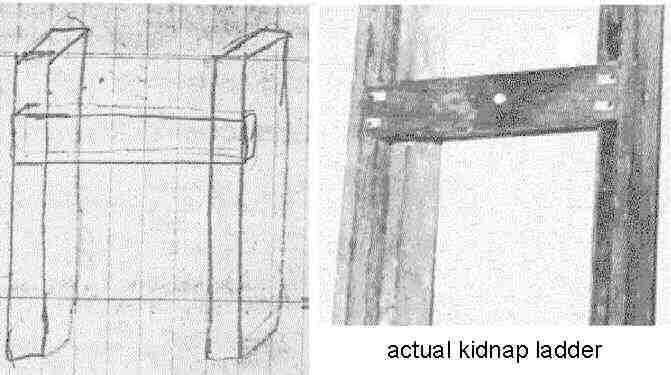 When presented with this sketch among his own papers (S-261), he blamed it on a visiting child. Yet it is identical in mortise construction to the kidnap ladder, with the same indented rungs. He did not name the itinerant artist. Click "singnature" button below for more FAQs. P.S. 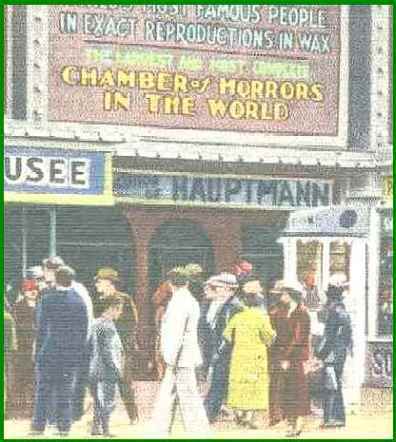 (Popular Culture): The late-1930s entrance of the Eden Musee Wax Museum in Coney Island featured the Electrocution of Hauptmann. For a chronological overview, visit this Lindbergh Case Timeline. A fictionalized 1933 film version, Miss Fane's Baby is Stolen, had a screenplay by Adela Rogers St. Johns. You may also visit author Jim Fisher's Lindbergh Case website. For comments on this Site, please contact Allen Koenigsberg We may have an original Hand of Hauptmann (1937) by J. V. Haring available! (* Trial of the Century phrase first attributed to Damon Runyon - CD-ROM of the Official Transcript now available, with FBI files as well). Since Nov. 19, 2000: 112,621 visitors. New counter starts Nov. 1, 2008.